Use point-to-multipoint network type on the hub router to ensure the hub router is always the IP next hop for the DMVPN routes. Use point-to-multipoint network type on the spoke routers to ensure the OSPF timers match with the hub router. The DMVPN part of your network should be a separate OSPF area; if at all possible, make it a stub or NSSA area. If absolutely needed, use OSPF LSA flood filter on the hub router and a static default route on the spokes. Any recomendations on setting up a (dual) hub running OSPF with phase 1 spokes AND prevent all spoke routes from being seen at other spokes? Think service provider environment. Thanks, great blog! Close to mission impossible. All spokes have to be in the same area as they are connected to the same subnet (which is why OSPF over DMVPN does not scale) and thus they get all intra-area information. The only trick you could use would be flood filters on the hub http://wiki.nil.com/OSPF_flooding_filters_in_hub-and-spoke_environment but then you need static default routes on the spokes. OK if you have a non-redundant setup, "slightly" harder if you need redundancy. Hmm. The flood filter trick might work in a redundant network by using IP SLA to track static routes on the spokes, right? What IGP would you recommend to address scaling? EIGRP? 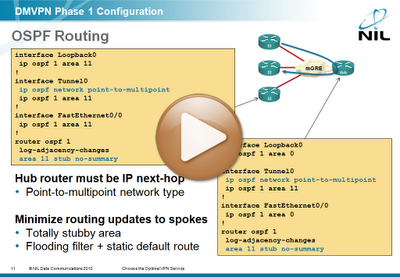 All of these topics are discussed in my DMVPN webinar (hint, hint ;) ); the materials include tested router configurations for 20+ different scenarios using OSPF, EIGRP, BGP and RIP.